From NRA TV, a very nice history of the Sig P-210. My new model carries on the tradition very nicely, indeed. Nice review. A bit bumpy and not very accurate and wrong in some points. The info is sufficient for small talk with non-SIG collectors when money is not involved. Ian McCallum and Michael Zeleny provide definetly better and more accurate information about the P210. More P210 Goodness from "Shooting Times"
Just got a new P210A from an online vendor at a good price. Outta the box with minimum cleaning and NO TAKEDOWN, it shot my Sellier & Bellot 115's Perfectly into tiny little groups. The trigger was a little stiff at first, as was the magazine insert/release. But after a very enjoyable brief break-in, everything smoothed out wonderfully. It's a tight, very accurate gun to shoot. But I have not used any of my reloads or cheap ammo. Gunmakers,like everyone else, can produce less than optimal products. But from my experience with my new P210...it looks like Sig has put a lot of attention and expert gunsmithing into them." To each his own and Congrats on your fine "Original" P-210collection. Please don't piss on my side of P-210 ownership. I respect your opinion and hope you'll offer the same courtesy to me. I wasn’t talking accuracy. My $1100 CZ Tactical Sport has that in spades. That’s cool if you like the P210A. They seem to be a good value for the dollar, much like the CZ. The American P210 is a fine gun. If you don't like it because it's not the original Swiss, that's fine. But to call it an abomination is just ridiculous. Its an abomination on Sig's part to call it a P210. However, I am glad they designated the "A" to set it apart. I don't feel its a fine gun. I feel its decent quality, accurate and a good value, much like a CZ TS. Sig built it to be affordable to the masses. Its the same quality as their 1911 Super Target and the P Series Elite pistols. They all feel about the same and prices are very similar. Definitely solid, nothing special. Not to even mention the Swiss guns. 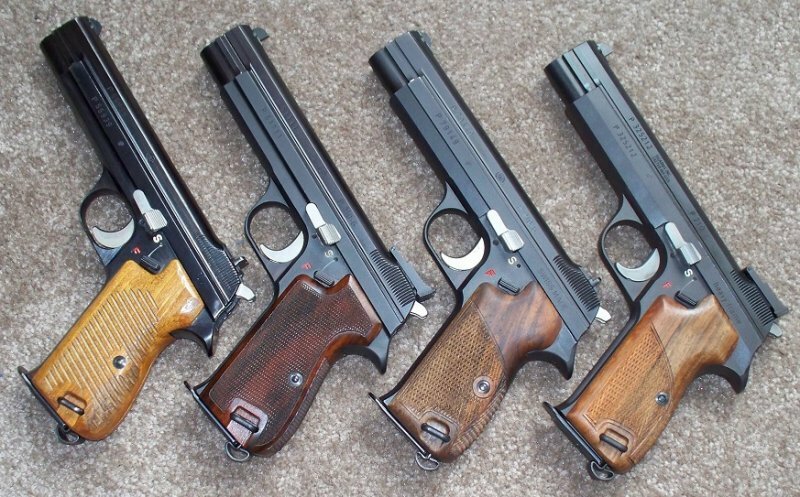 They sure as hell aren't built like the German Mastershop pistols such as the X-Five or P210 Legend. There's a reason those bring $3500+ on the used market. To each their own, of course. I'm not saying people shouldn't be thrilled with the P210A. After all, they didn't pay that much. Its a good value at $1400. I honestly don't care whether folks agree with me or not. If you feel the P210A is the equivalent of the Swiss or even the German models, well I guess you just saved yourself a ton of money. More power to you. I agree with your opinion....it's yours and I respect you chimming in and adding to this discussion. I have an older X5L1 imported as an "Engineering Gun" for Sig USA to check out. It's excellent and incredibly precise and accurate. But if anything breaks, I don't know If i'd be able to get any replacement parts these days on this side of the Atlantic. Yours may have the same potential problem if you shoot them a lot. At least with my P-210-A, Sig USA should have the parts I might need to put it back together if needed. Old 210's, like my old X5L1, are from another era of precision gunsmithing. I try to shoot my guns whenever I can, without regards for possible failures and repairs if needed. I also have a budget to deal with and my P-201-A Target fills my expectations nicely withouit tying up even more $$$$. Agan, Congrats on your fine collection. Take the blinders off. The only reason they command that price is collectibility. From as pure quality, fit and finish standpoint the Mastershop is at a Dan Wesson level of work. You are not the only one here who plays in the deep end of the pool. I disagree with you. I think it’s more like Ed Brown quality, rather than Dan Wesson. However, to each their own once again. I was never that impressed with Dan Wesson, frankly. I’m not saying the Mastershop was Swiss P210 level or the Korth I posted recently, but it’s a lot nicer than anything Sig builds in the states. Again, there’s a reason they sell for what they do. There’s a reason they’re collectible. They aren’t even all that rare yet. They are well built with a ton of attention to detail. You don’t get that from Exeter. Never did. Ive been dealing with rare and high end guns for many years. I’m fortunate enough to own a lot of handguns that are much nicer than the Sig Mastershop stuff, but I still think very highly of them. Congrats to you as well sir, especially on that awesome X-Five. The old L1 before the rail is a classy pistol. Here's the models I own. The X-Five L1, X-Five Short, and the three Sport models (P220, P226, and P229). Those were the guns that the X-Series replaced in the mid-2000's.